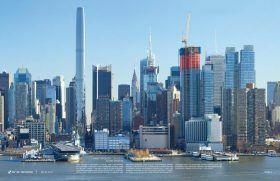 Architecture firm RB Systems has just published a set of renderings that explore the new supertall tower typology that’s been gaining popularity in New York City in recent years. First spotted by New York Yimby, the “New York’s Super Slender” tower in the renderings is shown on a small (only 30 meters by 30 meters) vacant West Midtown site at 265 West 45th Street. The tower was designed to squeeze onto a 98-foot wide lot, which would put it among New York City’s most slender towers. Rising 1,312 feet high, the theoretical building would provide modern, ergonomic, sustainable office spaces. The project reflects a likely path for skyscraper design in the coming years, when the city’s towers will need to meet the challenges of dense city centers and a dearth of large vacant lots coupled with a demand for new properties.